Fresh Paint Studio is all about the experience - the experience of creating and appreciating inspiring art. Fresh Paint Studio is all about creating art fearlessly. 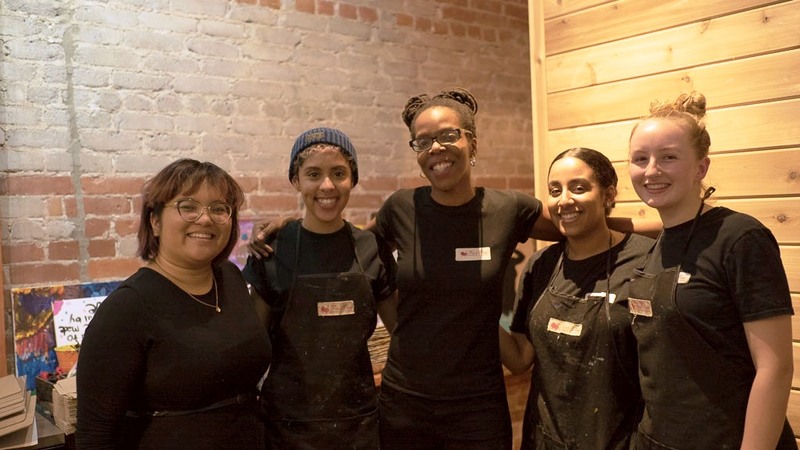 Fresh Paint Studio provides you with an opportunity to create art and connect through art in a relaxing social environment. We believe that there is an artist inside of all of us and it just needs some encouragement to reveal itself. At our core we are all creative beings and we find solace in the act of creation whether experiencing the creative art of others or creating our own. Here at the Studio, you will have an opportunity to create a piece of art that you can take home, enjoy a beverage or pastry in our cafe or purchase inspirational art prints, greeting cards and wearable art from our retail store. Fresh Paint Studio was born from many hours of thought about how to take the art experience to the next level. We believe that there is a need for alternative art spaces that elevate the act of creation and while making it fun, relaxing and rewarding. We are a team of friendly, professional artists and art lovers who are committed to reconnecting you with the love of creating art. We believe that the art experience does not have to be confined to galleries, museums and other conventional art spaces. We believe that at Fresh Paint Studio – the art is experience should be relaxing, social and fun. One part chemistry lab for painting and creating. One part café spot with tasty treats. One part lounge with relaxing music, spoken word and other inspiring entertainment. One part retail space with unique artsy items like art prints, wearable art and greeting cards. Blend this all together and you have Fresh Paint Studio. An artistic experience that satisfies the senses. Fresh… not previously known or used; new or different; recently created. Fresh Paint Studio is all about letting you tap into your unknown creativity. It is a space focused on nurturing creative new ideas, nurturing the imagination and giving it a place to breathe. Fresh Paint Studio gives you a chance to open up and let your creativity just be. My passion for creation – moves beyond my own personal satisfaction in making art – I’m passionate about inspiring others to create. I have worked in schools and with community organizations to facilitate workshops focused on self-expression through art and poetry. It is so rewarding to be a spark or a catalyst to help someone else to open up and share their creative voice. And so, with my passion to inspire creation - Fresh Paint Studio was born. Roxane Tracey, visual artist and poet is the owner of Fresh Paint Studio. Her dream is for Fresh Paint Studio to be a creative community space that inspires a love for creating art while bringing out each person’s inner artist. Roxane is the creator of self-entitled ‘Poetic Art’ – a creative fusion of inspirational poetry and vibrant art images. For over 10 years, Roxane has exhibited her Poetic Art and engaged audiences throughout Canada and the US. Roxane’s work is currently reproduced as vibrant originals, prints, greeting cards, books and wearable art. Her inspirational line of greeting cards and prints are currently distributed throughout the US and Canada and can be found in various gift stores, bookstores and other commercial outlets. Her original artwork can also be found on the walls of Canadian universities. When Roxane is not managing Fresh Paint Studio or creating her own art she can be found facilitating art and poetry workshops for groups of youth and adults in local schools and at community centres. Roxane has facilitated community workshops for youth and women at the YWCA women’s shelter, various women’s groups at Women’s Health in Women’s Hands (including an HIV-positive women’s group), UrbanArts, Moorelands Community Centre, as well as various primary schools and high schools throughout the Toronto District School Board (TDSB). I am where I am because I could be no other place. A friend once told me that the passages of your life have already been written, you are simply following in the footsteps. As an artist, I have gathered much of my inspiration from my travels throughout West and East Africa. I am always inspired to create art that has a message of empowerment – especially for girls and women. And last but definitely not least, as the owner of Fresh Paint Studio, I am inspired to bring out the artist in you. I’m passionate about the art of creating. As a visual artist and poet, I have spent years crafting my thoughts, emotions and inspiration from a blank slate and bringing them to life. People ask me how long I have been creating and the best answer is – my entire life - creativity is part of me. I have a love for words and images – and from this passion was born, my ‘self-entitled ‘ style of artwork called Poetic Art – a fusion of inspirational poetry and vibrant artwork. Fresh Paint Studio is seeking an experienced Art Instructor and Studio Assistant. The selected candidate will have experience teaching art to adults and children. Their teaching experience should be in the form of art workshops, paint nights or art classes. The selected candidate should also be comfortable facilitating art parties for both adults and children. The selected candidate will be required to conduct art parties that include ‘paint night’ style parties for adults both on-site in the studio and at off-site locations in the GTA. The selected candidate will have an artistic specialty or specialties which they can also introduce to the studio. This artistic specialty would be incorporated into the studio schedule of art workshops. Additionally, the selected candidate must be comfortable exploring various art forms and developing art workshops for the studio’s customers. The selected candidate must have excellent customer service skills, exercise patience in a teaching setting, be reliable, hardworking, punctual and professional. The selected candidate will be required to instruct art workshops, lead art parties for children and adults, help facilitate after school art programs for kids, and lead corporate painting events both on-site at the studio and at off-site locations in the GTA. The selected candidate will also be required to provide support for the lead instructor for art workshops, corporate painting events and art parties for children and adults in the form of set-up, clean up, and general support, etc. While working on-site at the studio, the selected candidate will be required to assist drop-in painters (children and adults) with their painting requests and needs. While working on-site at the studio, the selected candidate will be required to assist patrons who drop in for coffee, tea and pastries in the café. Experience in the food and beverage industry is an asset. Experience working in a retail and customer service environment is also an asset. Flexible availability including evenings, weekends and some daytime hours is required. Compensation for the position is $15/hr. Hours will fluctuate with a minimum of 8-10 hours per week. To apply for the Art Instructor & Art Assistant please send your cover letter and CV to Roxane Tracey – info@freshpaintstudio.ca.